What is MOC's favourite beer? It has been settled, MOC's favourite beer is Beau's Lug Tread - brewed right here in Ontario. Or is it settled? 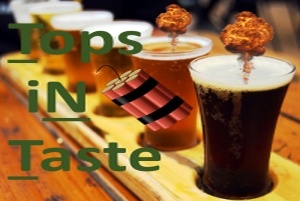 After decades of deriding Dana's beer choices at MOC, members were shocked to discover that it was HE who brought MOC's top rated beer to the 2016 MOC beer tasting event. Members had always assumed he just picked beers in oversized bottles as overcompensation. After over 3 decades of making fun of his beer choices MOCers were left scratching their heads. Despite being a rigourous blind taste test, some were so shaken by this revelation they are demanding a recount. One MOCer quipped, "sure Lug Tread, won the electoral college vote, but did it win the popular vote?". 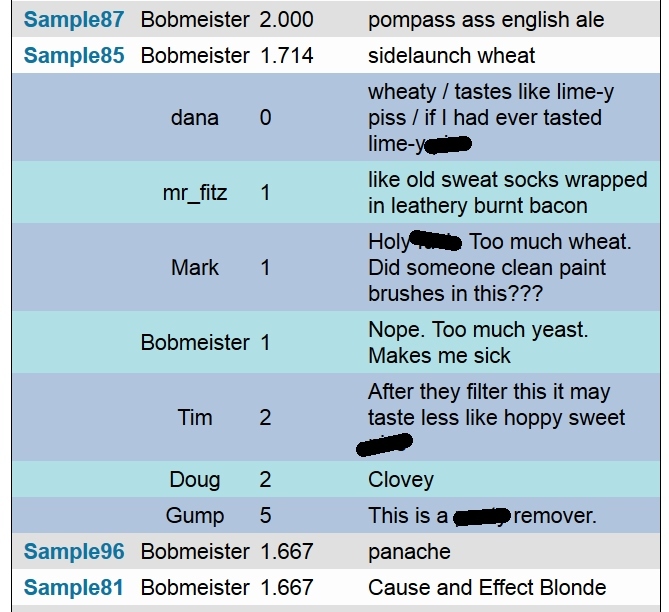 In the infamous exit survey there were a number of requests for "beer tasting" - "Let's do that again". When behind a password, the social filter switch is clearly in the off position. Who will bring 2017's winner? It may came as some surprise, but MOCers are both fickle and hard to please; so the challenge is palpable. You will need a thick skin - diplomacy was a rare commodity at the 2016 tasting. However, last year's event did narrow the field a bit. Members can explore the MOC16-01 TNT tasting and maybe even bring one or two of the top ranked beers from last year. Apparently, we prefer beer that is not too hoppy, not too citrusy, not too wheaty, not too heavy, not too light, not to butterscotchy, not too turpentiney and not too yeasty. There is a bent towards the lighter beers - the sweet spot laying somewhere between an "oaky amber" and urine. The prize is bragging rights. With this year's tasting imminent and Dana having been silent on the issue for almost a year, prepare for him to squeeze a year's worth of bragging into the few short hours left until the MOC17-01 tasting. You can make this year's tasting a success by bringing 2-4 473ml (converts to 16 oz) cans of what you think MOCers would enjoy. There is bound to be some overlap, so having extra will not hurt? So Dana, bring your Beau's again this year, and let the cage-match begin. All proceeds from the event will go to the United Way. If any of you MOCers are feeling down on "Blue Monday", take heart in the fact that you have played a part in making somebody else's winter a bit brighter. 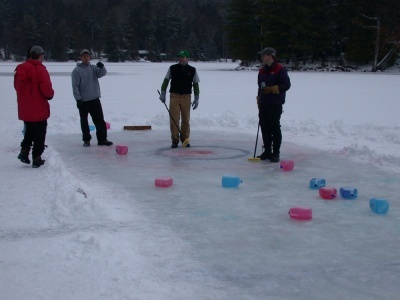 While we wait for the bay to freeze solid enough to again use our own curling stones, others in our backyard and around the world are curling outdoors - inspired by our DIY curling stones. Over the years we have had communications from Russia, Switzerland, New Brunswick, Ontario (Bancroft, Moore Lake, Salmon Lake, Apsley), Maine, and a F.U.C.C.A. from the US. So, by MOC standards we have gone viral (view-threshold = 5). 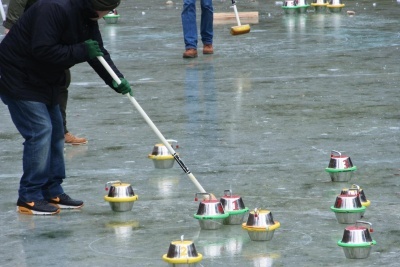 DIY Swiss curling stones. No doubt filled with chocolate. The latest posting on the "make your own curling stones forum" comes from a group in Switzerland. This is of course fitting given the love MOC has for all things concerning cheese, chocolate, and the cowbell. We got a fever...and the only cure is more, eh. That forum gives everyone a better sense of the complexity and difficulties involved in passing stones. Of course all of this begs the question - when does inter-group competition start? When is the road trip to Moore Lake? When does this become a phenomenon with league play, big sponsor dollars, network coverage, salary caps, doping controversy, the first-ever curling brawl, a league corruption scandal, and an in-depth retrospective on ESPN of the glory days focused on the original match between the Minden Outers Club and Moore Lake? Who knows; but given the potential, you might not want to be the last one to find yourself a good sports agent. Concerned about the emphasis on fatty red meat on the menu at MOC, two MOCers have taken it upon themselves to steer us towards healthier, lean turkey - aka "the other fowl meat". Not content to settle for what is available at the local grocery store Chris and Rob have made it their mission to procure us some grade A Ontario "free range" wild turkey. The pair have joined forces with brother-in-law "Brett" and local "Steve" - the latter, who reportedly designs custom hardware for the Canadian military's anti-turkey division. Veteran MOC hunter James has declined to join the group citing the group's refusal to wear the highly visible safety-orange hunter's caps - attire the group claims is, "quite simply, uncool". It is a common assumption that the North American wild turkey - meleagris gallopavo - not Janeane Garofalo (common mistake) - is dumber than a wet sack of hammers. But, according to the group, both are, "actually much smarter than you might think". So smart in fact, that after several months of hunting, our intrepid hunters have only bagged a single turkey and a northern cardinal "bystander". Ironically the cardinal naturally wears the safety-conscious orange/red hunter's cap. 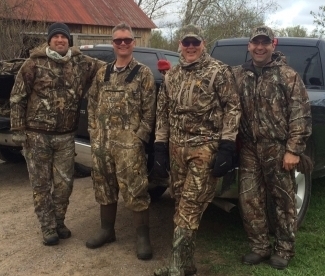 Though the group claim the small bird's demise is "regrettable collateral damage" in the necessary pursuit of healthy lean meat, there is rampant speculation the hunters may have shot the small bird simply because it was being "uncool". What the group finds most frustrating is that turkeys seem to be ubiquitous in small town Ontario - freely roaming streets, yards and parking lots. Yet, somehow they become scarce among heavily armed camouflaged middle-aged men. The 4 men are not too concerned though, citing several mitigating circumstances from each hunt, issues they say require only minor tweaks to their technique and then it will, "rain turkey". In the meantime, their musical and whiskey drinking abilities have improved several-fold. Urban MOCers, who now increasingly encounter wild turkeys roaming city streets, have taken a different approach to outsmarting these cunning birds. For example, Eric suggests that on your way home from work, "simply drive along side them, ease down your window and say, 'hey turkey, I am a friend of your parents and they asked me to come get you and bring you home". Voila Tom's your uncle...and he is invited for dinner! 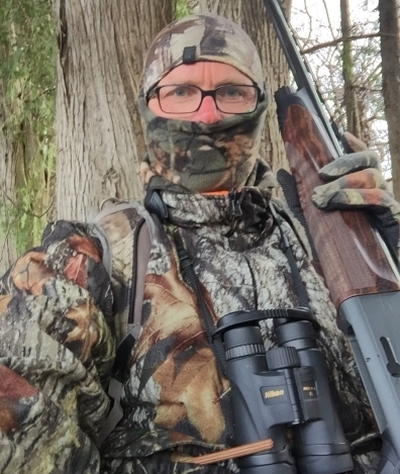 When asked, what it is like to witness firsthand the comeback of the wild turkey in Ontario, to know that unchecked development, ecosystem change and over hunting are indeed reversible for some species, a spokesperson for the group said, "Ya, sure, that's cool too".